An oasis in the desert. An outdoor park on the Las Vegas Strip. Sound like a mirage? The Park, MGM Resorts’ immersive outdoor dining and entertainment district connecting New York-New York, Monte Carlo and the new T-Mobile Arena, will make this a reality come April. The new destination reflects an all-encompassing commitment to environmental sustainability that began with design, drives construction through to completion and strives for the reduction of natural resources. Smart-scaping: Envisioned as a slice of Las Vegas’ surrounding environment in the Mojave Desert, The Park will be lush with natural desert vegetation. Plant species such as agave and yucca, as well as the tree species of Palo Verde, Acacias and Mesquites, call the desert their home and are adept at conserving water in arid climates. 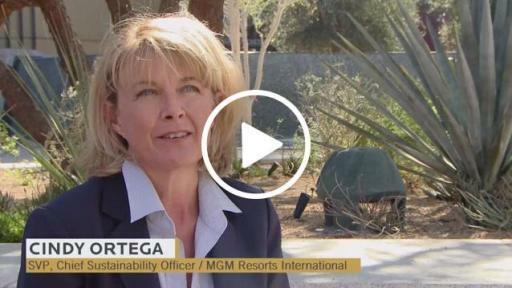 Looking locally: MGM Resorts locally sourced many of the materials found within The Park. The most notable are the sandstone planters. Red meta-quartzite stone sourced from Las Vegas Rock’s (LVR) Rainbow Quarry, just 30 miles from The Park’s site, will be utilized throughout the space, most significantly in the artful planters. Not only does the partnership with LVR illustrate an alliance with the local business economy, but the use of locally produced materials also reduces the fossil fuel used to transport these elements. Cooler than the rest: When temperatures soar in the summer months, Las Vegas pedestrians will find respite from swaths of asphalt and urban traffic when they enter. The Park is designed to reduce this heat-island effect, using the laws of nature to keep its temperature cooler. The sun’s rays are reflected due to the light-colored pavers, while shading can be found throughout The Park. The canopy of fully grown trees and series of 50-foot shade structures provide cover from the intensity of the summer sun. The shade structures collect heat at the ground level and circulate it upwards and away from passersby below. Myriad features will reduce heat within the space, keeping the atmosphere more favorable year-round, such as elevated planters blooming with desert flora, sandstone surfaces that are cool to the touch and dissipate heat, refreshing water features and reflective building rooftops. LEED Gold restaurants: The restaurant corridor at The Park is designed in harmony with the outdoors – and in accordance with the U.S. Green Building Council’s LEED Gold standards for Core and Shell development. The plans for Beerhaus, Sake Rok, Bruxie and California Pizza Kitchen optimize efficiency in energy, water and waste for construction and operations. Re-using and Recycling: From the removal and replanting of mature trees from the original site to procuring building materials with recycled content, the material components were considered core elements of The Park’s design. All of the furniture, shade structures, waste bins, tree grates and building structures have been manufactured using combinations of pre- and post-consumer-recycled steel. Furthermore, 80% of all waste was recycled during construction. Even the centerpiece art installation Bliss Dance is an existing sculpture, selected for its rich regional history and cultural symbolism. Water Wise: Designers were incredibly mindful of the valley’s fragile hydrology when planning The Park, taking measures to mitigate the use of the city’s water supply. An on-site well will provide all of The Park’s irrigation water. Sculptural waterscapes will operate on a closed-loop system that captures, filters and reuses the water. Point-source drippers that conserve 72% more water than traditional sprinklers and an anemometer that controls water features based on wind speeds are just a few of the water technologies that will save millions of gallons each year. Furthering the Future: As the first development of its kind on The Strip, The Park’s integration of sustainable practices achieves a sense of environmental responsibility and inspiration for what’s to come. Not only will guests play a part in environmental stewardship through public area recycling, but there also will be numerous educational opportunities throughout the complex. Signage and descriptions of the biological and technological aspects of The Park will introduce guests to these impacts while opening minds to the reality of the future in the desert. Through appropriate development and conscious consumption, the possibilities are endless.